Most kids are like mine, in their little cocoons, practically incapable of imagining life as an adult. Polls show children tend to resort to the familiar — the doctors, teachers, scientists, athletes, firefighters, lawyers and police who fill their books and televisions and shape their everyday experiences. They are woefully underexposed to the estimated 12,000 careers that exist in the world today, and the plentiful pathways to those careers that begin as early as preschool. Achieve Escambia is building a movement to flip the script on college and career readiness, to redefine what success looks like, from cradle to career. By one popular estimate, 65 percent of children entering kindergarten this year will ultimately end up working in completely new jobs that don’t even exist right now. Further, according to a Harvard Graduate School of Education study, in the 10-year period from 2008 to 2018, the U.S. economy will create 47 million jobs. However, only 36 percent of these jobs will be available to people with a high-school diploma or less, compared to 72 percent in 1973. 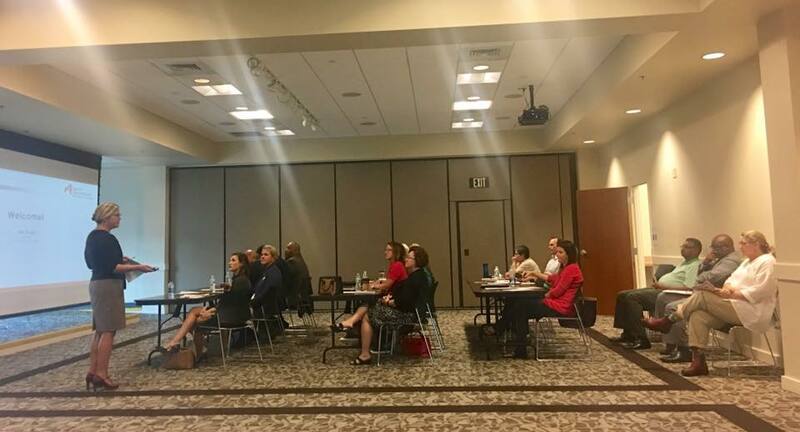 This week, Achieve Escambia hosted the first of two interest sessions for people working at the crossroads of workforce development, economic development, career preparation, job training and college completion. Over the course of two hours, we learned what career readiness means to our local community, and how we can build a more prosperous future that leaves no one behind. Those of us participating in Achieve Escambia believe dialogue is critical because it provides the foundation, the scaffolding and the coalition needed to cement our ability to prepare for future skills, jobs and industry needs — and to seize local opportunities presented by these trends as they emerge. With the world changing at such rapid speeds, it will take community-wide problem-solving to keep children, youth and adults on the path to labor force participation. But by working together, shining the spotlight on solutions, and sharing information, we have every reason to be hopeful about the future of the Escambia County workforce. Achieve Escambia and its Career Readiness Collective Action Network launching this fall is one of the most ambitious endeavors happening in Florida right now. But while the work ahead is long-term, we don’t have to wait around to start doing what we can to influence and prepare a child, student or adult on their pathway to achievement. Just ask one of Achieve Escambia’s dozens of partners who are re-engaging youth in schools by encouraging career aspirations; exposing students and adults to skills that help them succeed in a variety of fields; and providing coaching, mentoring and development services that translate to productive employment, to name just a few. We can all do our part to ensure our community is ready for the jobs of today and tomorrow. For me, that means two things: opening my mind to what “success” looks like, including and beyond the confines of a traditional four-year college degree, and resisting the urge to close the door on careers that my tween, skateboarder and artist may discover and love. Kimberly Krupa is director of Achieve Escambia. To learn more about career readiness or the collective impact movement, email director@achieveescambia.org.